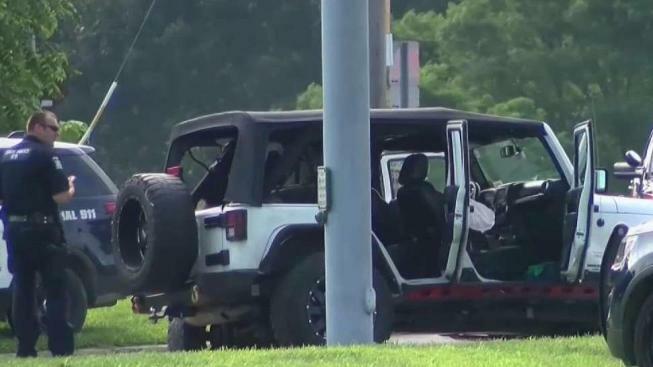 Two children were hurt when they were ejected from a vehicle during a serious car crash near the entrance of a water park on Long Island, officials say. The two children, a 5-year-old boy and an 11-year-old girl, were flown to an area hospital in serious condition. Seven others were injured in the Tuesday afternoon wreck on Route 25 in Calverton, near Splish Splash Water Park, according to authorities. None of the injuries are life-threatening. Authorities said a Jeep Wrangler with seven people inside was turning onto Splish Splash Drive when it pulled out in front of a Dodge Charger. The two cars collided, sending the two children, who were not in car seats or wear seat belts, flying. Officials said witnesses reported one of the Jeep’s tires then struck the children. The seven other people injured were taken to area hospitals to be treated. The driver of the Jeep was ticketed. The investigation is ongoing.